iDirect Evolution installation in Mozambique. This is a second install of an iDirect Evolution system in Mozambique for the same client (a coal mining company). First install was earlier this year and that system was located at the companys head office in Tete (Mozambique) providing an internet connection, 2 voip lines, vpn connection etc. This install is at the base camp close to the actual mining field (coal mining), and is located North East of Tete at a remote location in the jungle. At the time of installation the camp was under construction and communication is a vital part for this operation and for future running of the local offices. A concrete platform with a pole for the dish was already in place before we arrived. The size of the pole was wrong so we had to obtain a bigger one. This was finally found at a local metal shop. The only suitable piece they had was actually being used for an existing gate but they were very happy to cut it down and sell it to us ($25). This piece was then welded on top of the existing pole and thus created a perfect fit for the dish. 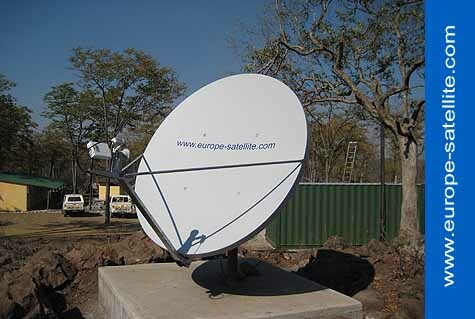 We had to cut a tree because it was exactly in line of sight between the dish and the satellite (Eutelsat W3). It took the local builders about 2 � hours to cut it. All the network equipment is installed in a container with air conditioning. The satellite modem and ups are built in a 19� rack. This is separated from the local network equipment and connected with a fibre-optic cable. This is to protect systems in case of a lightning strike. 180 cm Channel Master dish. We used a Horizon HD-TC8 for pointing the dish to Eutelsat W3.